2014-2015 HASTAC Scholar Jaclyn Partyka shares some details regarding her newest digital project. When I first entered the HASTAC program at the beginning of the academic year, I had no idea how much the digital humanities would impact my research and approach to studying literature. I had a vague idea that I wanted to look at digital forms of self-fashioning on social media and how these kinds of narratives challenge or contribute to current theorizations about authorship, but I wasn’t sure how digital tools and new research strategies would work out. My dissertation as a whole looks at how celebrity and canonical authors use hybrid forms of literary genres – often between the novel and traditional autobiography – to respond to the perceptions of their authorship within the literary marketplace. For my final chapter, I wanted to look at Salman Rushdie’s 2012 memoir Joseph Anton since it directly responds to the often inflammatory rhetoric surrounding the Verses Affair – when the Ayatollah Khomeini decreed a fatwa against the author’s life following the publication of Rushdie’s fourth novel, The Satanic Verses (1988). This was a global news event and forced Rushdie to go into hiding and live with constant police protection for ten years so it’s not very surprising that a memoir detailing an inside look into Rushdie’s life during this period would act as a means for the author to write back to his numerous fans and critics. 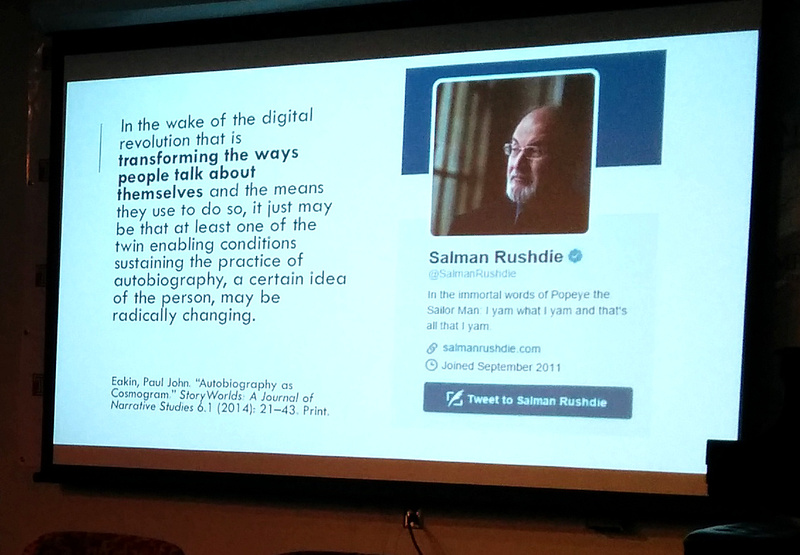 Part of my approach to reading Joseph Anton was to consider it alongside Rushdie’s significantly active Twitter feed. To do this I had a colleague write a script where I would be able to scrape all of Rushdie’s tweets from 2011-2013 so that I could have a record of his activities before and after the publication of the memoir. Using this data, I was able to use a few of the digital tools I learned about over the past year. 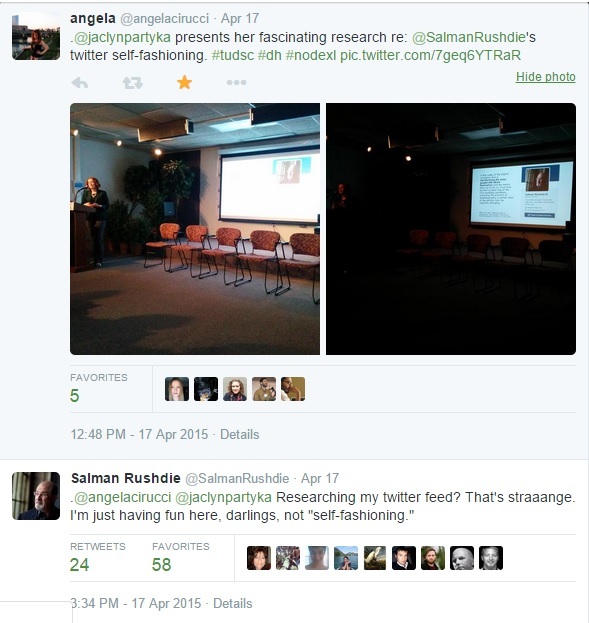 First, I used NodeXL to tag and visualize Rushdie’s egocentric twitter network. Then, I used Voyant to generate some word frequency graphs and visualizations to trace topical trends across his twitter feed. I presented some of the preliminary details of my findings at the HASTAC digital scholar presentations on April 17th. And that’s when things got a little more interesting. It should come with no surprise that the digital humanities have seriously embraced forms of social media, such as twitter (and this blog! ), in order to easily spread insights, developments, and innovations throughout the scholarly community. Ergo, the HASTAC presentations were live tweeted by a few audience members. And someone noticed. In many ways, Rushdie’s wry response here does much to support my argument about how celebrity and canonical authors participate in curating their brand of authorship – and online forms of social media are just a new terrain for this drama to play out. Of course Rushdie knows what he’s doing in presenting himself online, even though he attempts to deny it. So, have I accidentally written myself into my dissertation with the help of the digital humanities? This isn’t necessarily a bad thing; rather, it says a lot about how much literary studies have changed in our contemporary moment and how online forms of literacy are becoming much more integrated into contemporary literature.